ANNA Taggart has taken her business from small beginnings at her kitchen table to a professional career servicing Britain and Ireland and poised to move much further afield. It’s a fascinating story of a young woman who wanted to fulfil her mother’s dying wish and keep the family tradition of baking alive. Anna’s mum, Betty Macklin was well known in antique circles. She had a quaint little gate-lodge shop at the Antrim Road end of Fortwilliam Park where it was her habit to give customers a cup of tea and a piece of cake or a scone when they came to browse. Soon Fortwilliam Antiques became the centre for morning coffee and afternoon tea. Betty was a perfectionist. She baked every morning before leaving the house and soon businessmen left their offices to have a bit of craic and relax among the antiques and the pavlovas, children called in on their way home from school, teachers met for a catchup after a busy day. Anna’s father Joseph ran a gents outfitters further down the Antrim Road and this business ethic was passed on to their children, Anna and her sister Helen. Sitting in Anna’s kitchen last week, the rich smell of baking in the air, I tucked into a Posh Scone, one of Anna’s signature offerings. Crisp on the outside, like a cloud when you bite into it and covered in cinnamon butter, a hint of vanilla plus raspberries and strawberries. Delicious. But this is only a small part of the operation because Yummy Bakes has a portfolio of the most mouthwatering offerings, shortbread, biscuits, cakes and scones. Ingredients are all top class, locally sourced, the best of butter, oats, cinnamon – the list goes on and the orders come in. 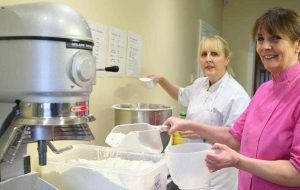 What makes Anna’s business special is the fact that she prepares everything at home in Whiteabbey, immediately blast freezes the raw product, packages and labels the orders and sends them off to distributors, to stores, shops and restaurants where they are freshly baked from frozen and decorated on the day of sale. When it comes to biscuits she packs them in ‘pallets’, 64 boxes with 120 biscuits in each. Just before Christmas she sent a supply to a distributor in London and the day after St Stephen’s Day got a call for more. And yet it all started by accident. As her mother talked through the family recipes going back generations, Anna noted them down and began baking. She took scones and shortbread into the nursing home for a tasting among the residents and staff and before long she knew she was on to a winner. And so began the business of kitting out the bright and airy kitchen, converting the garage and buying in mixers, freezers, boxes and labels. Every batch is labelled in detail – the ingredients, allergy advice, storage instructions and how to bake from frozen. One chef told her she’d given him back three and a half hours a day as his preparation time involved only cooking what she had sent him. Anna and her one full-time assistant begin work at seven in the morning until and continue until 3.30pm, though Anna’s day often stretches into the evening. She loves what she does and since establishing Yummy Bakes in 2012 she has had seven awards, proving that she’s a master at her craft. It’s a far cry from Anna’s last job working in Ulster Television where, as assistant to the head of news, she was taking phone calls warning of bombs and shooting and taking copy from reporters phoning in details of the horrors that were unfolding before their eyes. There’s a calmness about Anna and her kitchen is immaculate and runs like clockwork. Husband Thomas is always on hand with support and although still in education, daughter Ciara is making a name for herself as a harpist and singer son Conor is ‘gigging’ all round the country. I’m sure Betty Macklin would be amazed to see how her recipes have been developed, buns with honey and cinnamon, wheels with apple and pumpkin seed, scones succulent with cherries, vanilla, sultanas, lemon, maybe coconut or pear and flaked almonds. Lemon zest is an important ingredient – no joke preparing 50 in a day, washing, grating off the rind and squeezing the juice. There’s no limit, the only criterion is quality. “I believe people are fed up with the mass market and want fresh home-made cakes and scones when they go out to a coffee shop or a restaurant. Eventually I’d like to have my own ‘front,’ she added – to you and me, that’s her own cafe!